The Water Tupelo (Nyssa aquatica), is best identified by it's combination of wetland habitat and and large very long stalked leaves. They can reach heights upwards of 100 feet tall and are deciduous in their native range. The Water Tupelo grows in a erect and upright form with usually only one single trunk. The bark of the Water Tupelo is grey and color and young twigs appear to have more of a reddish tone. The leaves are alternate, simple and ovate or oblong, wedge shaped or even heart shaped in some cases. The male and female flowers generally occur on separate trees and appear in compact clusters in the Spring. The fruit is oblong and dark blue to purple in color, borne singly on a conspicuous stalk, it matures in late Summer to early Fall. The Water Tupelo is native to river swamps, floodplains, and lake margins from Virginia south to Northern Florida, West through Illinois and Southeast through Missouri, Arkansas and Eastern Texas. The most similar species to the Water Tupelo is the Ogeechee Tupelo (Nyssa ogeche). Meet more trees on our website www.ArundelTreeService.com or follow our blog www.MeetATree.com . 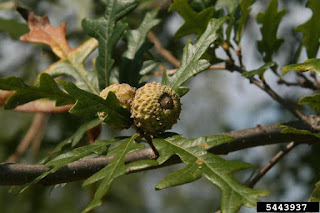 The Overcup Oak - Quercus lyrata, (also called Swamp Post Oak, Swamp White Oak, or Water White Oak) is a medium sized southern deciduous tree that does not generally reach heights of more then 60-90 on average. 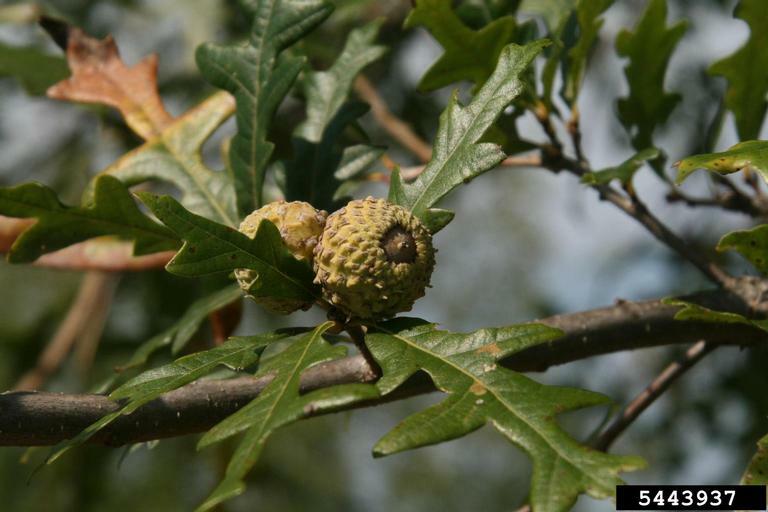 It grows in an erect form with a single trunk that is usually short in comparison to other Oaks. The tree generally has a symmetric form with slender, most times with dropping branches, crown of open grown trees are often have lateral branches that spread perpendicular to the trunk. 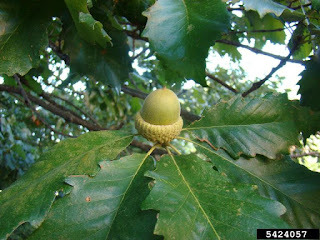 The name Overcup Oak comes from the fact that the "cup" of each acorn almost completely covers each nut. The lumber from the Overcup Oak has little commercial value, primarily because of it's spiral grain, frequent knots and tendency to crack or split open during the drying process. The leaves are alternate, 6-8 inches long and 1-4 inches wide with deep sinuses and 5-9 rounded lobes. The leaf base usually tapers from a thin point to the widest lobes that occur around the midway point of each leaf. Most commonly found growing in flooded low land areas, river bottoms or swamps. It grows best on wetter sites around the Coastal or Gulf Plains from Delaware in the North south from Florida to Eastern Texas and up the Mississippi River bottoms through Southeastern Missouri, Southern Illinois, Southwestern Indiana or Western Kentucky. The Swamp Chestnut Oak - Quercus michauxii, is a medium to large sized deciduous tree that reaches heights of only 40 feet on average but can grow as tall as 100 feet tall in it's ideal settings (well drained alluvial floodplains). Regardless of the overall height and site location the crown remains compact. The leaves of this tree range in size from 4-8 inches long. The leaf blades are leathery in textured and diamond shaped with the widest portions being located two third of the way to the tip of each leaf. Each leaf is coarsely toothed on all sides in a wavy fashion. The leaf surfaces are dark green and smooth while the bottom downy and paler in color. The bark patterns of the Swamp Chestnut Oak vary and can be tight with shallow parallel ridges/valleys or have long peeling side strips. The bark of the tree differs in color depending on the location, it is lighter gray in upland settings and dark gray in lowlands. The acorns of the Swamp Chestnut Oak are 1 inch long and light brown in color and sweet to the taste. It is very hard to differentiate between the Swamp Chestnut Oak, Chinkapin Oak and White Oak as they share many of the same characteristics. Swamp Chestnut Oak grows best in low lying bottomlands that periodically flood whereas the other two grow best in well drained soils. The lumber from the Swamp Chestnut Oak is grouped with other White Oaks during lumber production. It can be used in almost any application from tools to furniture to baskets. The lumber has a very nice appearance and can be left natural in many applications. The Tamarind - Tamarindus indica, is most easily identified by the combination of pinnate leaves, blackened trunk areas, zig zag limbs and variable sized and colored fruit. The Tamarind is primarily an evergreen or semi deciduous tree that can reach heights of 65-100 feet or more. 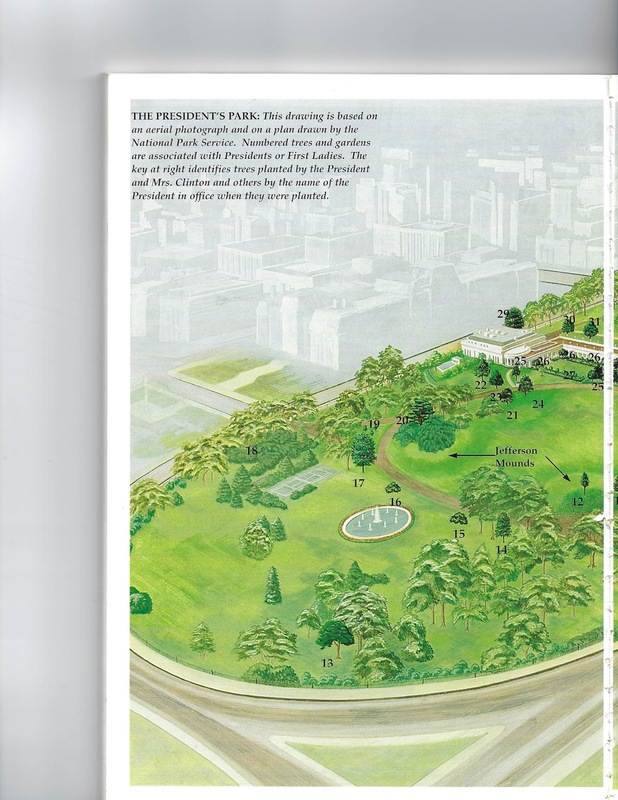 The diameter in the United States tends to only reach 5 feet while in it's native range it has been reported as large in diameter as 25 feet. It was introduced originally from tropical portions of Africa and India and has escaped cultivation and has established itself in Southern Florida. The leaf of the Tamarind is alternate, pinnate and 7.5-15 cm long. The leaflets are in 10-20 pairs even in numbers, oblong and oblique at the base and squared at the apex. The upper leaf surface is dark green or yellow green in color. The flowers are bisexual about 2.5 cm in diameter, 4 sepals, 3 petals yellow in color with pinkish streaks and crinkled margins appearing in Spring to early Summer. 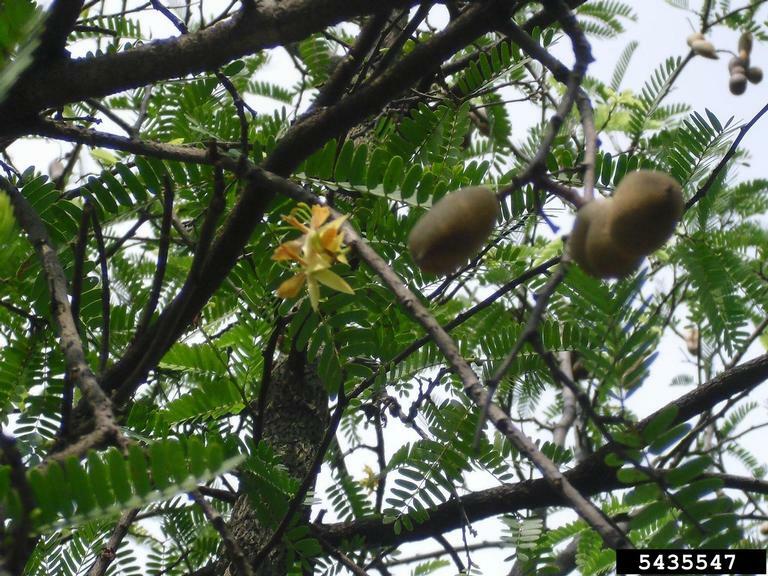 A similar species the Wild Tamarind - Lysiloma latisiliquum, also has zig zag twigs and is similar in stature, however it's bark is a paler white-gray in color and it's plat, twisted pods do not vary in size. The London Planetree- plantanus x acerfolia - is a hybrid of the Sycamore and the Oriental Plane. London Planetree are large deciduous trees that reach heights of 65-100 feet when mature. 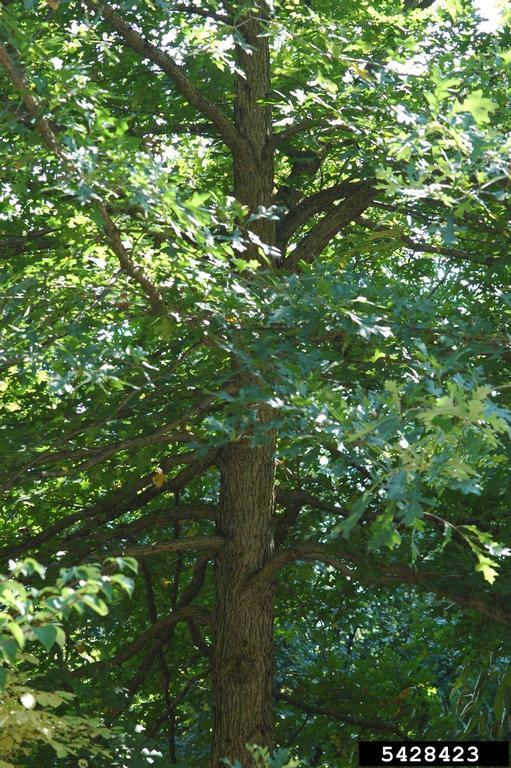 It is one of the most commonly planted street trees in the United States because of it's high tolerance to both polluted air and limited rooting areas. It possesses a very strong hybrid vigor and grows well in almost all locations, but is not very tolerant to extremely low temperatures. It has a fairly long life expectancy and in many cases "outgrows" planting location by lifting sidewalks and other surrounding obstacles. Thought to have been originally grown in Spain during the very early 17th century. It is recorded in both France and Spain around 1650, and in England from 1680. The leaves are very similar in shape to the Maple with a tri-lobed appearance. They are a bright green color when young and are coated with very tiny hairs which disappear by the Summer season. In the fall the leaves slowly turn to a bright yellow color before falling off. The bark is almost identical to the Sycamore in appearance, smooth Silver Grey that sheds to show a warm brown shade underneath. The bark makes for a nice point of interest even in the winter when the leaves are all gone. The lumber is known as Lacewood and has a very unique and decorative pattern when cut, it is light in color with dark red-brown flecks throughout. The flowers are borne in one to three dense spherical florescence on a pendulous stem, with male and female flowers occurring on separate stems. The fruit matures in about 6 months, to just under a half inch in diameter, and is made up of a dense spherical cluster of achenes with numerous stiff hairs. The fruit cluster breaks up slowly over the winter to release the numerous 2–3 mm seeds, this allows for great seed disbursement. 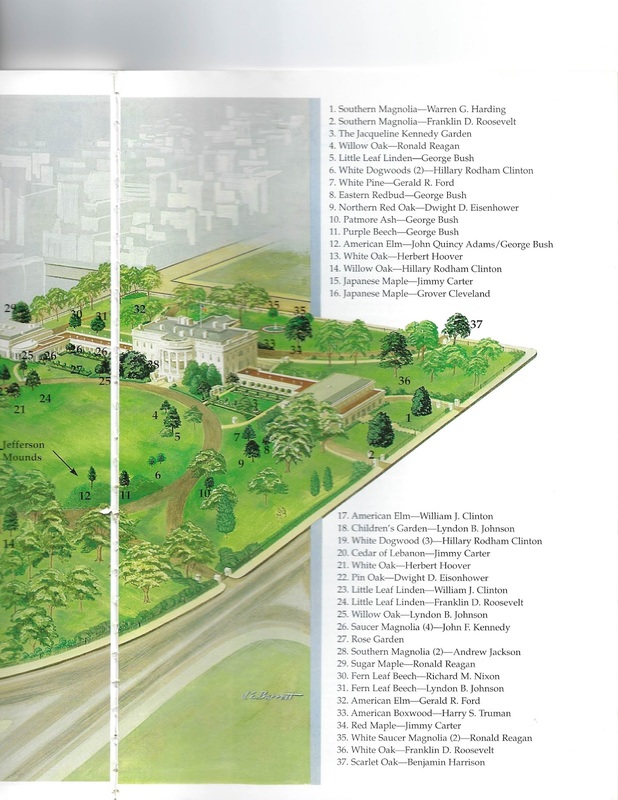 One of the diseases that has known to significantly effect London Planetrees is Cankerstain. Thousands of London Planetree have died from Cankerstain in the Eastern United States since the early 1930's. Cankerstain is caused by the fungus Ceratocystis fimbriata. The fungus enters the trunk or branches through weakened areas such as injuries, or saw cuts and moves inward from there. Once infected death of the entire tree usually occurs within a year or two. Diseased trees should be removed and destroyed as soon as diagnosed to prevent spread. The London Planetree is also susceptible to Lacebug, Plum Borer and Anthracnose to name a few. London Planetree are often pruned using a technique called pollarding. A pollarded tree has a very noticeably different appearance than an unpruned tree, it will appear much shorter with stunted, clubbed branches. Pollarding requires frequent maintenance (the process must usually be repeated annually), it creates a distinctive shape that is often sought after in plazas, parks, main streets, and other urban areas where overall size and appearance is of great concern. London Planetree can be found at most local nurseries and is recommended 3A to 10B. It is very important to plan ahead before planting a London Planetree, take into consideration how big it will be at maturity- 65-100 feet tall in very large! The Casuarina / She-Oaks - Casuarina is a small genus only including 17 species, only 3 are naturalized in the very Southern half of Florida. 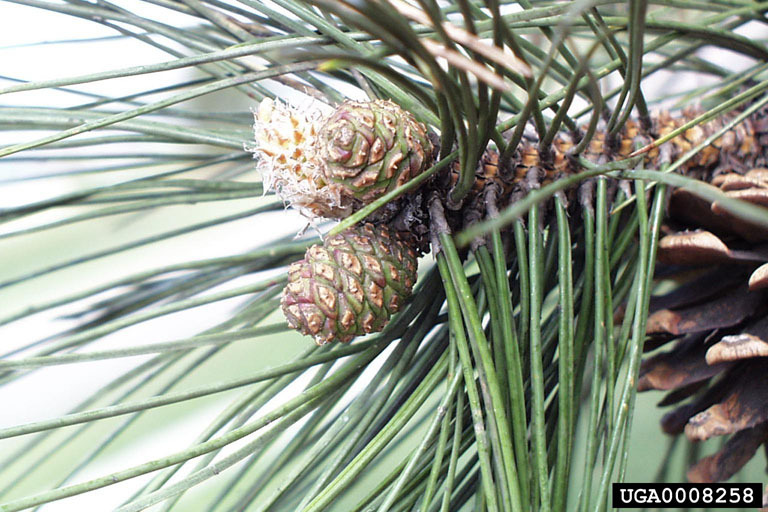 Native to Australia, Indonesia and Asia only, the Casuarina are considered to be one of Florida's most troublesome and aggressive invasive species. All three of the varieties found in Florida are referred to commonly as Australian Pine which is a direct reference to the similarity in branching. The leaves are tiny and scale like and encircle the branchlets at regular intervals. The number of leaves per encircling whorl provide the primary means for distinguishing one species from another. The Casuarina or Beefwood family is made up of about 90 species, only the Casaurina are found in the United States. Most are evergreen with pine like needles and cone shaped fruit. The flowers are generally uni-sexual, male and female can appear on either the same tree or different tree, depending on the species. The Quaking Aspen - Populus tremuloides - is also called the Trembling Aspen, Golden Aspen or Mountain Aspen. With the smallest of breezes the leaves will flutter hence it's name. When fluttering the leaves even making an audible sound which would explain why the Onondagas called it the "nut-kie-e" which means noisy leaf. This tree has a very remarkable native range covering a majority of the Northern portion of the continent, ranging from New Foundland South to Delaware in the East and along the Coast of Alaska and British Columbia running South through the Rocky Mountains. Although it is not found in the South it does have one of the widest distributions of any tree in North America. It can be grown throughout hardiness zones 1-7. It is often times one of the first trees to appear after a Forest Fire. It is a fast grower often gaining 24 inches in a single season. Aspen wood Is used to make a variety of items such as wooden toys, tongue depressors, popsicle sticks, clothes pins, crates and even for paper pulp. The leaves are rounded triangles with small teeth along the margins. The leaves are a glossy green above and dull below, during the Spring they change to a vivid Yellow or very rarely Red. They are arrranged alternately on the branches. Catkins are long and silvery and appear between April and May. In the late Spring, it's tiny seeds which are enclosed in cottony tufts are dispersed by the wind. The bark is a Greenish-White to Grey in color, it is often marked with black knots or horizontal scars. The Aspen is a favorited food and shelter source for many different type of wildlife. The leaves and bark are eaten by Deer, Elk and Hare/Rabbits. The Buds are an important food source for Grouse during Winter. Beavers not only feed from the Aspen, they also use it's lumber as a building material. Many different birds and butterflies make their homes in these stands. The Aspen holds the the title of largest living organisms on Earth, growing in clones/stand that reproduce primarily by sending up sprouts from their roots. For the most part each clone within a stand is connected to the next one through it's root system. One clone/stand in Utah (where it is the State tree) has been determined to have over 47,000 stems, this stand is estimated to weigh over 6,000 tons! While individually each stem lives 100-150 years, Aspen stands are one of the longest living organisms. One clone in Minnesota is estimated to be 8,000 years old, making it one of the longest living organism on Earth. 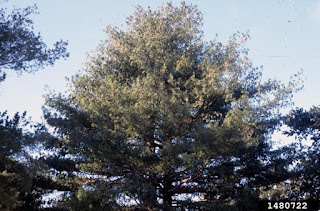 The Austrian Pine, Pinus nigra (also called the European Black Pine) is a medium sized evergreen that reaches heights of 60 feet tall and 2 feet in diameter. Similar to the Eastern White Pine and Red Pine, each year it grows a set of limbs in a whorled pattern around the trunk that resemble spokes on the hub of a wheel. 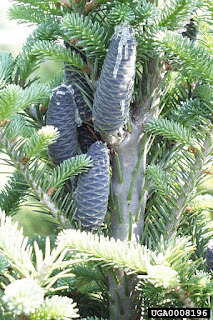 The limbs of the Austrian Pine form a large, thick, pyramidal crown that is filled with dark green needle-like foliage. This variety was one of the first trees introduced into the United States, often planted by homesteaders in the treeless Great Plains for protection from the sun, wind and snow. Native to Europe the Austrian Pine was first imported in the eighteenth century and has been widely planted as an ornamental through the middle and eastern United States. 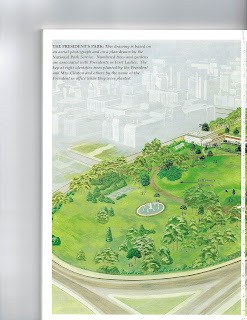 It's tolerance to salt and sulfur dioxide damage make it popular as an Urban Tree as well. In the Northern United States the Austrian Pine is often confused with the native Red Pine as they are similar in appearance, though the trained eye is able to distinguished between the two by inspecting the bark color. The evergreen needles range in size from 3-6 inches long and are bundled in sets of two. The needles are slender, shiny, stiff and dark blue-green in color. The cones are egg shaped and 2-3 inches in length at maturity. When the cones open and shed their seeds, they remain on the tree for several years before eventually falling from the tree. The bark of the trunk is a dark gray to dull/dark brown with a thin surface of flat plates that thicken with age. 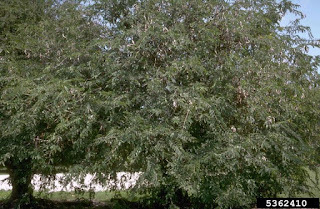 The Waterlocust-Gleditisia aquatica, is a medium sized deciduous tree that can reach heights of 50-60 feet tall. In open areas it tends to grow with a stout trunk and crooked limbs beginning low on the ground. In forest settings the tree grows straight up, forming a long limb free trunk and rounded crown. Regardless of the shape of the tree the limbs are usually armed with long, slender, sharp thorns that are sometimes forked and could be up to 4 inches long. The Waterlocust is usually found growing in moist areas, flooded swamps and river bottoms. It can be found growing along the Atlantic and Gulf plains from North Carolina to eastern Texas, extending up the Mississippi River floodplains to Southern Illinois and southwestern Indiana. Waterlocust leaves are compound or doubly compound, paired on lateral spurs that are 6-10 inches long with 12-20 oval blunt toothed leaflets. 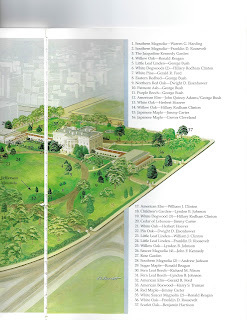 The leaflet surfaces are dark green to yellow-green in color above and slightly lighter below. The fruit is short and flat 1-3 inches long and 1 inch wide with 3 seeds inside. Pods are generally found hanging down in clusters but can be found singly on occasion. Waterlocust are found in hardiness zones 6-9 and prefer a mix of shade and sun. They have an extensive root system and can be planted to help control erosion. 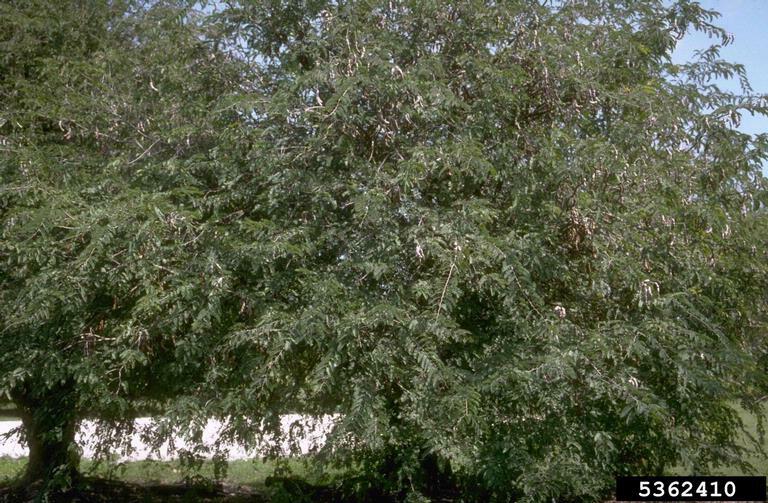 The lumber from Waterlocust trees is used for custom cabinet building and in applications that require a durable wood capable or withstanding long term soil contact. Intricate Hawthorn - Crataegus intricata, is easily recognized by it's shrubby form, dull yellow-orange fruit, 10 stamen flowers and hairless, glandular petiole. It is a small deciduous small tree or shrub that rarely reaches over 16 feet tall. It grows in a variety of forms from upright to arching or multi-trunked and shrub like. It is native to the Eastern United States and can be found in rocky woods, woodlands, on slopes and hills, and in forest clearings. It is found from Ontario, New Hampshire and Wisconsin in the North through Georgia, Arkansas and Missouri in the South. The Intricate Hawthorn is very common in the Appalachians. This variety is also called the Copenhagen Hawthorn, this alternate name is derived from an early comparison to a species native to Copenhagen, Denmark. The bark is gray and scaly, the branching is slender, straight or slightly curved sometimes armed with thorns of gray-black. The leaves are alternate, simple, broadly elliptic or egg shaped. The upper leaf surface is a dull green or yellow-green, firm in texture and usually firm to the touch. The flowers are 15-20 mm in diameter, white petals, 10 stamens, ivory anthers, creamy white to yellow or pink in color. The flowers appear in Mid-Spring along with the developing leaves. The fruit is a dull yellow to orange pomme that ranges in size from 8-15 mm in diameter, that matures in Autumn. The recommended hardiness zone is 4-9 and it is generally planted as an ornamental or in groupings. Balsam Fir (Abies balsamea), is a small to medium sized evergreen tree that reaches heights of between 40-60 feet tall and grows in a pyramidal form. Balsam grows in an upright pyramidal form. It is commercially important within it's native growth range, it is harvested for pulpwood, light frame construction material and as a Christmas tree. Balsam is a close second to the Fraser as a popular Christmas tree variety, they are very similar to one another in many aspects. Many types of wildlife, birds and mammals rely on the Balsam Fir for protection from the weather and for food from twigs and seeds. Considered a Canadian tree, it is found growing south through the Northern edges of Minnesota, Pennsylvania, Iowa and most of New England. The short awl shaped needles are flat and long lasting, they have a series of light stripes along the bottom that make the needles appear silver gray from below. On lower branches needles occur in two rows along sides of the branch, 3/4 - 1 1/2 inches long, spreading in form and not crowded. On older branches, the needles tend to be shorter and curved upward covering the upper sides of the twigs. Yields cones 2–4" in length that start out dark purple, turning gray-brown and resinous at maturity. Once the seeds are ripe, the scales fall off, leaving only the central axis of the cone in spike like stems on the branches. Seed crops occur at 2–4 year intervals and when present the small cones stand erect on branches the first year. 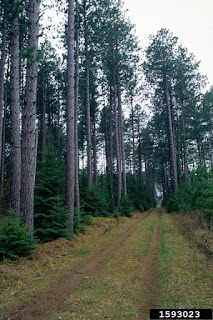 Balsam Fir is recommended for hardiness zones 3-5, and is a slow growing gaining less then 12 inches each year. This variety prefers full sun or partial shade, with four hours of unfiltered light recommended daily and cool, moist, well drained soils. The Balsam was named for the resin (also called balsam) that is found on the bark ridges and wounds, this resin was used during the civil war to treat wounds. The Tamarack- Larix laricina, is a deciduous conifer that can reach heights of 100 feet or more. It is native to Canada, Alaska and the Northeastern portion of the United States (South through Cranesville Swamp in Garrett County, Maryland) growing in elevations from 0-1200 m. Tamarack is generally found growing in well drained uplands and acidic soils with other Northern Conifers such as Spruce, Balsam Fir and Jack Pine. 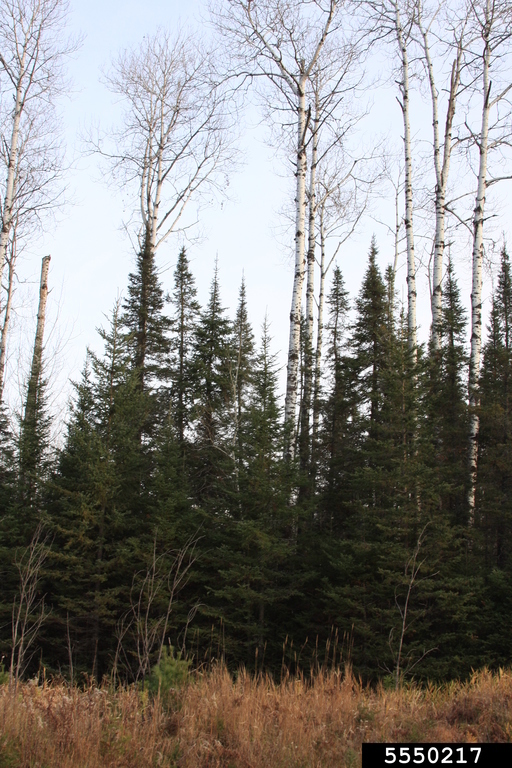 Occasionally Tamarack is also found growing in swamp areas of the far North, reaching the Arctic tree line. The Tamarack has an ovoid or conical crown, slender flexible orange-brown twigs. The leaves are needle like 2-3 cm long, light green in color becoming darker in the summer and then yellowing in Autumn before falling off. The needles are in tufts of 15-25 on each shoot. The pollen cone is spherical 3-4 mm in diameter and born on short shoots. The seed cone is larger 1-2 cm long but also spherical, red when young becoming yellow-brown when mature. 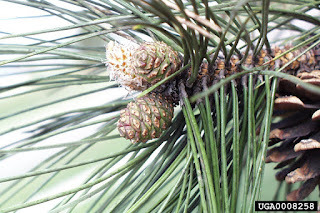 Cones generally fall from the tree after maturing or can remain for multiple years in some cases. Tamarack is very intolerant of shade, it can only tolerate some shade during the first several years, but must become dominant to survive. When mixed with other species, it must be in the over story never surviving as an under-story tree. Tamarack is good at self-pruning, and boles of 25 to 30 year old trees may be clear for one-half or two-thirds their length. The Tamarack tree was a very useful resource to the early Native Americans. Native Americans frequently used the Tamarack tree for various wood working and medicinal purposes. The needles were recorded to be made into a tea and used as an astringent. This tea was also used to treat dysentery and diarrhea. The Gum from Tamarack Sap was chewed for indigestion. 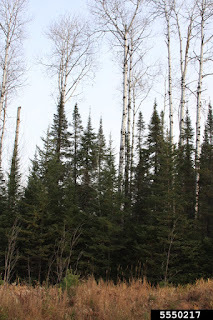 The inner bark of the Tamarack was finely chopped and applied to burns to assist in healing. The wood was not only burned for firewood, but crafted into canoes, and snow shoes. The word tamarack comes from the Algonquian and means "wood used for snowshoes." The Black Willow - Salix nigra (also called Swamp Willow or Gooding Willow) is a moderately large deciduous tree that can reach heights of 60-100 feet tall. It prefers wet soils, moist bottom lands, swamps, marshlands or waters edge locations and is not tolerant of shade. The Black Willow is often short trunked with branches beginning low to the ground, often leaning or crooked in form. Black Willow is a common tree in the Eastern United States, it is best known for it's ability to control erosion and ability to sprout new growth from broken branches lodged along river/stream banks. The bark of the Black Willow thickens with age and changes from thin and red - brown to thick and brown - black. In the winter the tree offers color from it's long, shiny red-brown to burnt orange twigs. The leaves are alternate, simple in shape and bright green in color on both the upper and lower surfaces. Leaves are 4-6 inches long and less then 1/2 inch wide, the leaf edges are finely toothed from base to tip. Recommended for hardiness zones 4-9, with a life span of 40-100 years. The wood is light in density and moderately soft, it does not easily splinter. Black Willow lumber is used for toys, crates and barn floors, but never as fine furniture. Black willow is generally not recommended for use as a specimen in residential landscapes because of its susceptibility to breakage, potential insect and/or disease problems, need for soils that never dry out, litter problems, shallow spreading root system which may seek out water and/or sewer pipes, and mature size potential. In the right location, its shallow roots can act as a quality soil binder which provides excellent erosion control. Shagbark Hickory - Carya ovata (also called the Scalybark Hickory or Upland Hickory) is a medium to large sized deciduous tree that reaches heights of 60-80 feet tall. It is native to the Eastern United States usually found growing naturally on dry sites. It's mousy gray to silver bark is easily identified by long narrow peeling bark scales that overlap and hang down in loose layers. The strips of bark create an almost armor that is very hard to pull off or remove from the tree. 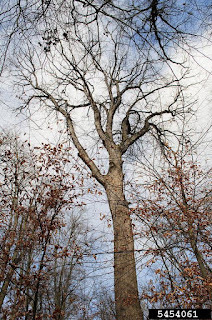 Generally the trunk of the Shagbark Hickory is long and void of limbs until reaching the oblong shaped crown that is full of short crooked limbs (this form may vary if grown in open setting instead of a forest setting). The leaves of the Shagbark Hickory are 8-14 inches long, alternate, compound, with five to seven leaflets that are dark yellow-green in color on the upper surface and paler (sometimes downy) on the loser surfaces. In the fall the leaves turn a brilliant yellow/ or golden orange or brown before falling off to make room for the next seasons new growth. The nut of this Hickory is covered with a yellow-brown or nearly black four ribbed husk that ranges in size from 1.25-1.5 inches long it is smooth and nearly round in shape. When the husk splits it releases a light tan, slightly flattened nut that is ridged on four sides with needle sharp tips on each end. Shagbark Hickory is recommended for hardiness zones 4-9. It can be grown as both a shade tree or a specimen tree and prefers dry soils. It is tolerant of drought and highly acidic soils but not tolerant to poor drainage or moist soils. 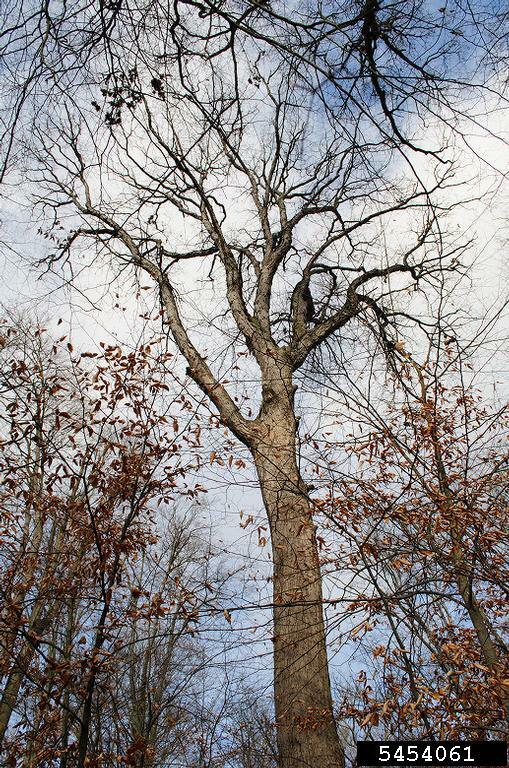 The lumber of the Shagbark Hickory is very resilient, tough, and highly impact resistant. A wide variety of birds and mammals feed off the large nut crops produced by the Shagbark Hickory each year. The Shagbark is very similar to both the Southern Shagbark and the Shellbark Hickory. 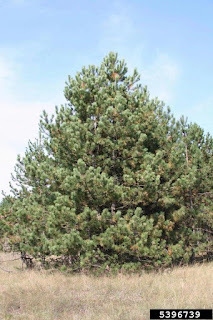 The Red Pine - Pinus resinosa, is a large evergreen tree that can reach heights of over 125 feet tall, but averages only 60-80 feet tall with a rounded trunk and symmetrical oval crown. The limbs grow in sets of clustered whorls that project from the trunk like the spokes of wagon wheels, they form a tight crown. Each year a new set of encircling branches is grown, the years progress the newer limbs grow at the top of the tree and lower/older limbs will begin to die and fall off making the lowest portions of the tree limb free. The bark of the Red Pine is Orange and flaky when young, becoming long plate like and flat topped red-brown in color. The bark The leaves are in the form of yellow-green needles that are 4-6 inches long and occur in bundles of two each. The needles are long and break easily when bend in half. The cones are about 2 inches long, rounded and brown in color. 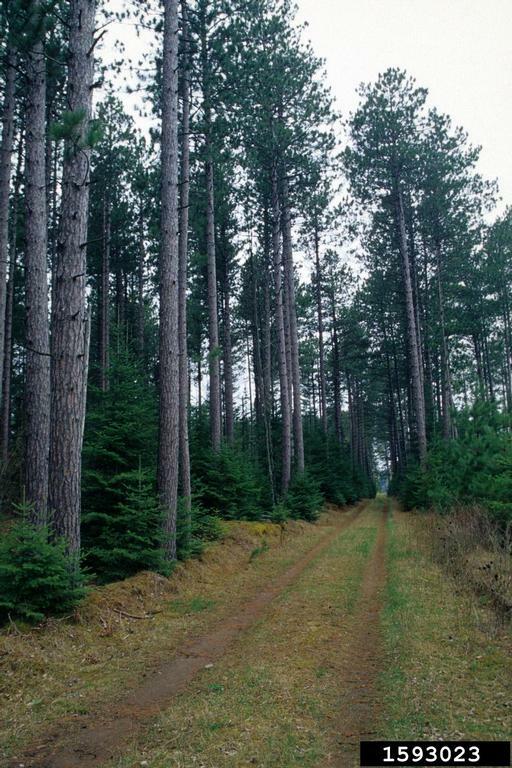 The Red Pine is most often found growing in the Northern states and Canada and is recommended from zones 3-6. It is native to North America, occurring on sandy soils on swamp margins, mixed conifer and deciduous hardwood forests south of the boreal forest from 200-1300 meters from Minnesota and Ontario to Pennsylvania and New Foundland.